and psychotic disorders (e.g., Rosenfeld, 1950; Teixiera, 1948). threats to her/his own collective or group survival. of functioning and dependence on others. Palestinians (Kira, 2006; Kira, et al., 2007) are other examples. traumatized populations and in political psychology. ent traumas and their appraisal in clinical and research settings. than the sheer occurrence of the traumatic event. 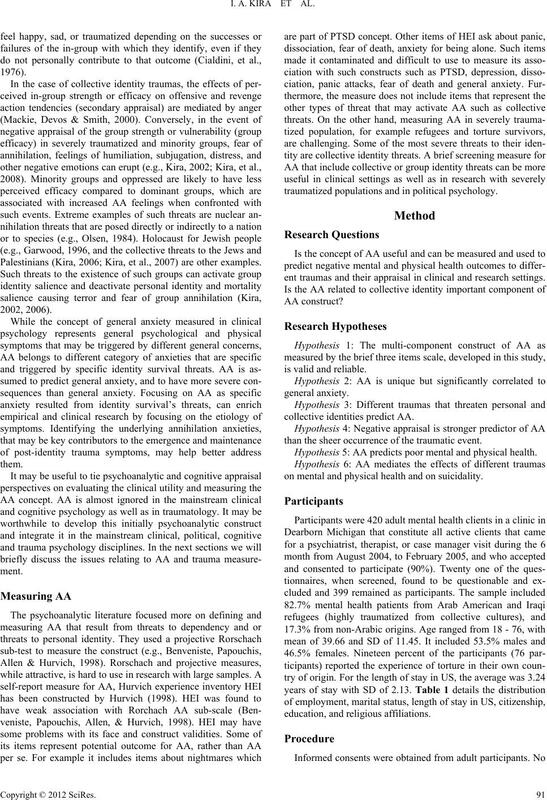 Hypothesis 5: AA predicts poor mental and physical health. on mental and physical health and on suicidality. The distribution of employment, marital status, length of stay in us, citizenship, education, and religious affiliations. vember 2004 to February 2005.
propriate for this refugee and clinical populations. and have high predictive power. scales alpha reliability coefficients ranged from .70 - .92. 3) I feel threatened by extreme inequalities in this society. symptoms rated on frequency and severity on a 5-point scale. scales: re-experiencing, avoidance, arousal and dissociation. to high (alphas are .96, .92, .89 and .85 respectively). people in general, feeling suicidal, and feeling like hurting self. sub-scales found to be high (.95, .97, .98, and .96 respectively). reliability coefficient of .91 in the present study. ies-Depression mood scale is a 20 item scale (Radloff, 1977). in a previous study was .91.
and AA as dependent variable controlling for demographics. depression, Anxiety, PTSD and other CTD sub-scales. equation modeling (SEM) with AMOS 7.0 (Arbuckle, 2006). validity. 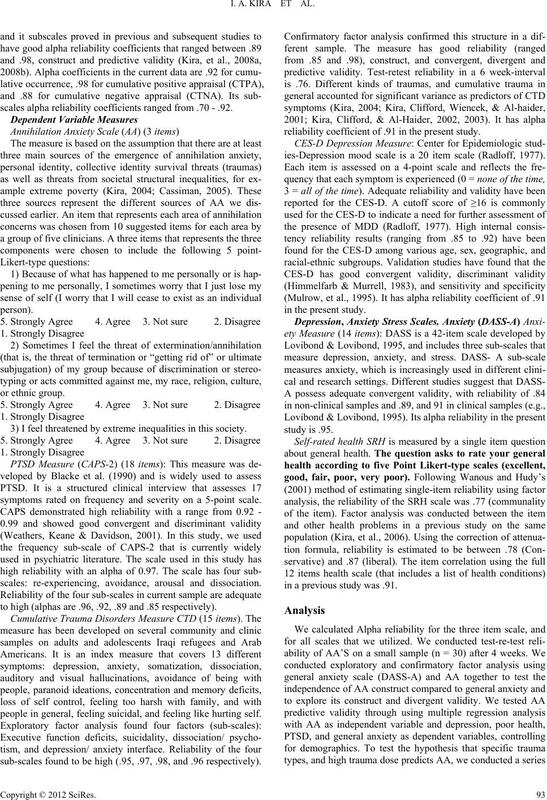 Test-re-test after four weeks (N = 30) reliability is .73.
as it is associated with dissociation and psychosis. this adult population. Table 3 describes these results. = .40), depression (β = .38), and poor self-rated health (β = .14). four. Table 3 describes these results. drome (a latent variable in the model) and on physical health. identity threats, rather than only threats to personal identity. threaten identity especially collective identity predicted AA. 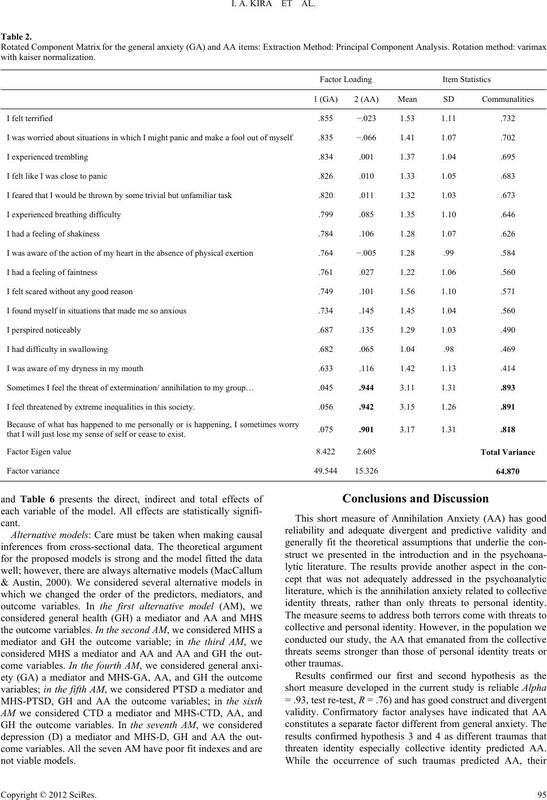 The effects of cumulative trauma and trauma types’ dose and negative appraisal on AA. < .05. **p < .01. ***p < .001. a) n = 399. 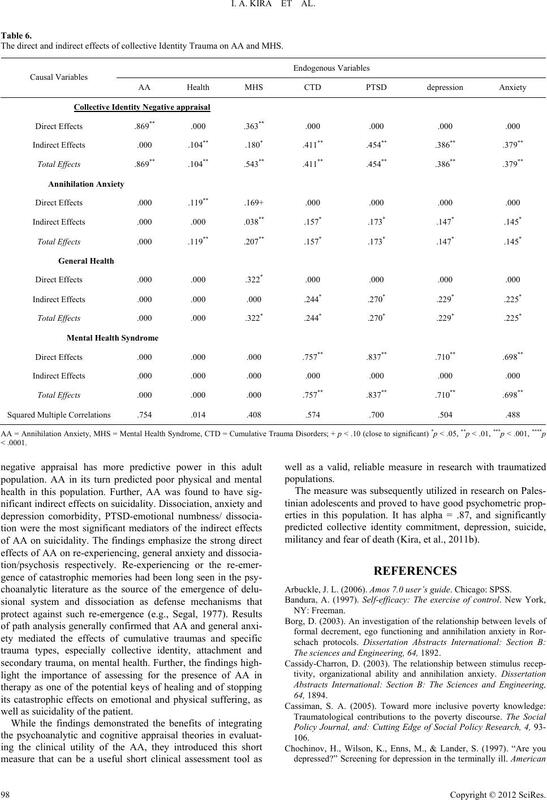 The effects of AA on self-rated health and mental health variables (a). (a) Findings are obtained after the effects of gender, age, marital status; education and income were controlled statistically; *p < .05. **p < .01. ***p < .001, n = 399. 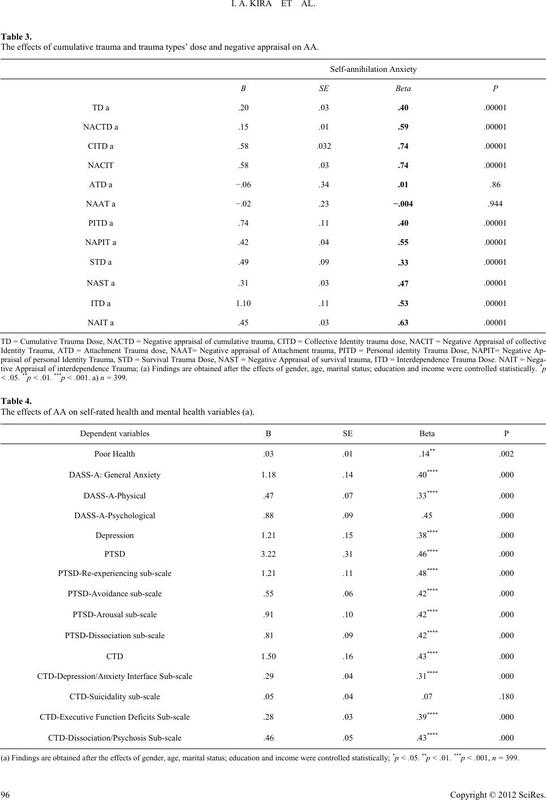 The direct and indirect effects of cumulative Negative Appraisal of Trauma on AA, MHS and Poor health. 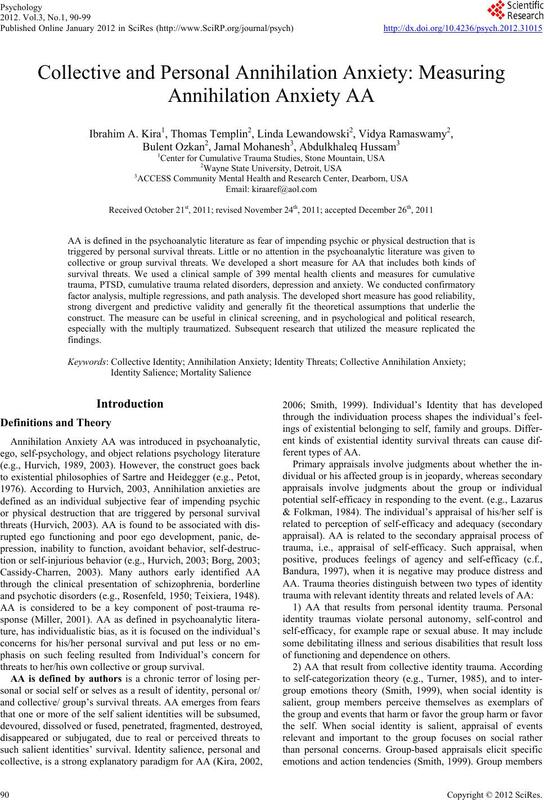 The direct and indirect effects of collective Identity Trauma on AA and MHS. well as suicidality of the patient. militancy and fear of death (Kira, et al., 2011b). Arbuckle, J. L. (2006). A m o s 7.0 user’s guide. Chicago: SPSS. The sciences and Engineering, 64, 1892. 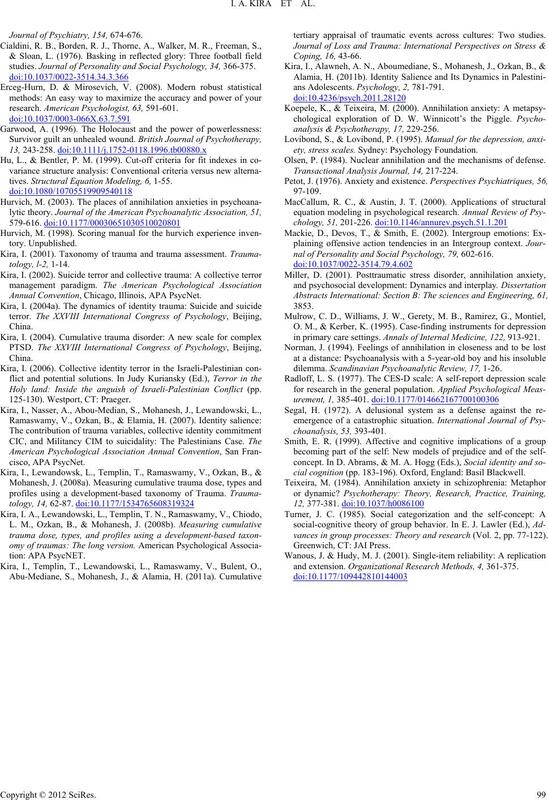 Journal of Psychiatry, 1 5 4 , 674-676.
studies. Journal of Personality and Social Psychology, 34, 366-375. Annual Convention, Chicago, Illinois, APA PsycNet. Holy land: Inside the anguish of Israeli-Palestinian Conflict (pp. 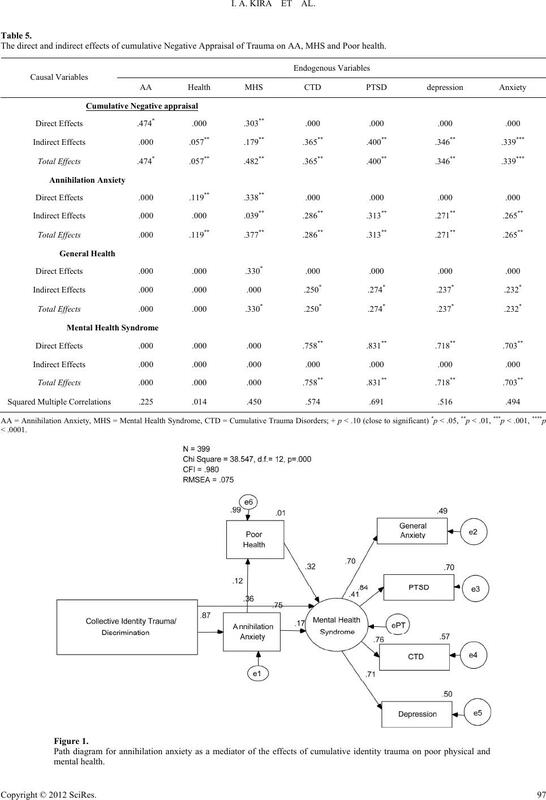 analysis & Psychotherapy, 17, 229-256.
ety, stress scales. Sydney: Psychology Foundation. Olsen, P. (1984). Nuclear annihilation and the mechanisms of defense. Transactional Analysis Jo ur na l , 14, 217-224.
nal of Personality and Social Psychology, 79, 602-616.
in primary care settings. Annals of Internal Medicine, 1 22 , 913-921.
dilemma. Scandinavian Psychoanalytic Review, 17, 1-26.
cial cognition (pp. 183-196). Oxford, England: Basil Blackwell. vances in group processes: Theory and research (Vol. 2, pp. 77-122).